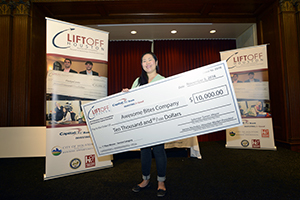 HOUSTON – The top three winners for the Liftoff Houston Start-Up Business Plan Pitch Day competition will receive cash awards on Friday, November 17 at HPL’s historic Julia Ideson building. 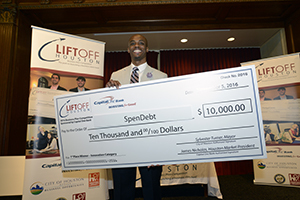 Liftoff Houston is sponsored by Capital One Bank in partnership with the Houston Public Library (HPL) and the Office of Business Opportunity’s (OBO). At the Pitch Day event, finalists will pitch their business plan to a panel of prominent judges. Based on the pitches, the judges will select the best business plans in three categories Product, Service, and Innovation. The winner of each category will receive $10,000 for his or her business plan. Thanks to Capital One Bank’s investment totaling more than $225,000 since the program’s inception in 2013 this program has been an incredible success. Liftoff Houston Start-Up Business Plan Competition engages and empowers Houstonians seeking to start a new business in Houston by providing them with access to essential information, resources and the support necessary to develop a sound business plan toward realizing their goal. Since it was launched in 2013, the completion has benefitted more than 3,700 individuals seeking to learn more about starting a business and has helped to start 12 new businesses. 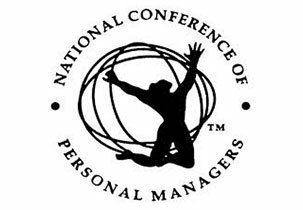 This year’s event is shaping up to be the most exciting ever, with Houston’s own Rushion McDonald serving as the Master of Ceremony! 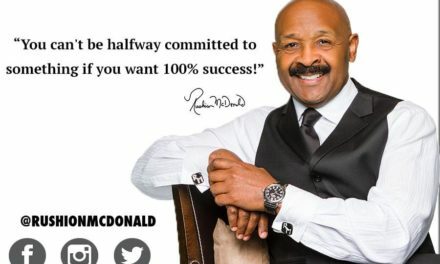 McDonald is an entrepreneur, two-time Emmy Award-winning executive producer, sitcom writer, comedian, and much more. 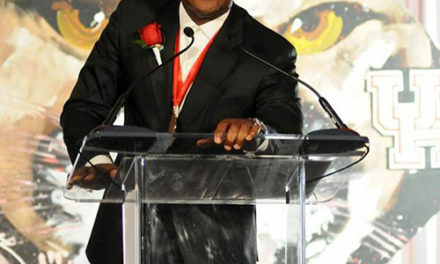 He is recognized throughout the entertainment industry for his successes in producing top television shows and hit movies, in addition to being the architect in building the Steve Harvey global media brand. 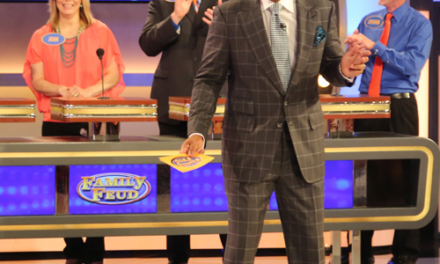 McDonald’s list of production credits includes television’s Family Feud, The Jamie Foxx Show, Sister, Sister, Steve Harvey Talk Show, Evidence of Innocence, and the films Think Like a Man and Think Like a Man Too. The event will be streamed live on Facebook/houstonlibrary. As part of the Fan Favorite award, online viewers and spectators at the Pitch event will vote for their favorite pitches using their smart phones or tablets. One Fan Favorite will be awarded in each category and will receive a $500 cash prize. Online viewers will be engaged throughout the competition and get to experience live interviews with the finalists, former competition winners, judges and other special guests! 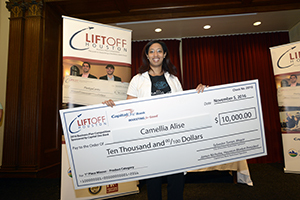 “Now in our fifth year, we have seen many talented entrepreneurs come out of the Liftoff Houston Startup Business Plan Competition. The Office of Business Opportunity is proud to support these aspiring entrepreneurs in their development,” stated Carlecia D. Wright, Director, Office of Business Opportunity. “HPL is thrilled to be a partner in presenting Liftoff Houston to residents in the City of Houston for the fifth year. Lift Off Houston continues to be an outstanding program that is helping to support people from communities all over the city realize their goal of starting their own business. This initiative provides to participants a vast array of critical business resources, workshops, and services available virtually, and in-person, free at their public library. We are excited and proud of the nine finalists who will have the chance to win $10,000 to invest in their new business venture and wish them the very best,” stated Houston Public Library Director Dr. Rhea Brown Lawson. The 2017 Liftoff Houston Pitch Day Competition will take place at the Houston Public Library’s Julia Ideson Building, 550 McKinney, St., 77002 on Friday, November 17, 2017 from 6 PM to 9PM. This event is free and open to the public. Paid parking is available in the garage under the Central Library. The underground garage entrance is located on Lamar street. For more details, visit: www.houstonlibrary.org or call 832-393-1313. 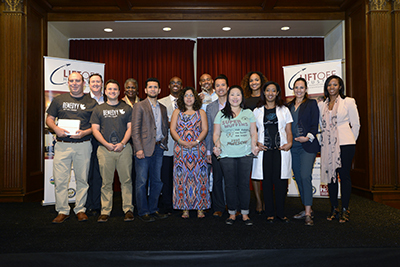 The Liftoff Houston Start-up Business Plan Competition is designed to encourage Houstonians to achieve the goal of business ownership while contributing to the local growth and sustainability of the Houston economy. People interested in learning to create a business plan and go through the process can do so at no charge and achieve their dream. To successfully research, develop and present the business plan, participants are required to have an HPL Card, attend industry-expert-led workshops ranging in topics from business plan basics to presenting plans to financial institutions. Participants must also attend information sessions to learn about the free vast resources available to support new business start-ups through HPL and OBO. Additional support is provided through professional business mentors to help participants further refine their business plan. To be eligible, applicants must have a for-profit business less than a year old, has earned less than $10,000 in revenue, and is operated by owners who live within the Houston city limits. The competition is five months long divided into four stages that include: orientation, workshops, mentoring, and business pitching. The workshops are offered at various Houston Public Library locations and local entities citywide.